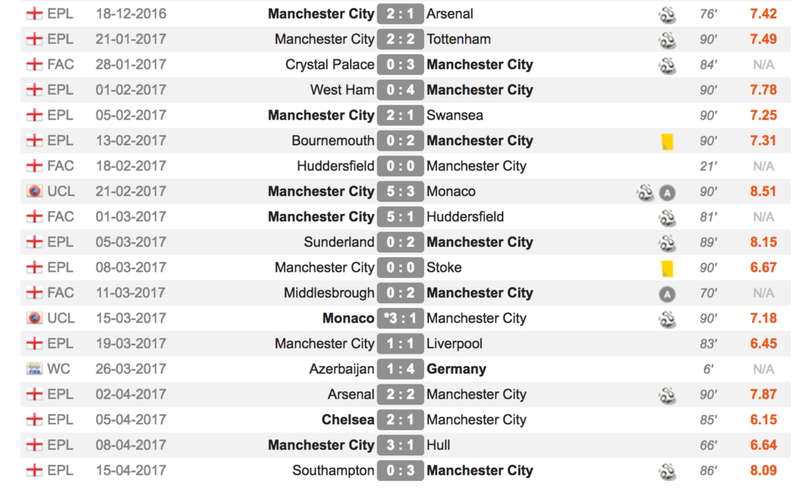 After a slow start, Sane has been tremendous for the last two months. -He attacks the channel like very few I've seen before. -He's the fastest player in the league. -And he's a clever player when it comes to dribbling and linking-up. He's also playing for Pep. If there is one coach who can help a winger with those attributes put it all together, it is him. Sane is going to be an excellent asset for both City and Germany in the coming years. Yaya Toure: "Leroy Sane is a fantastic talent. He’s very quick, sharp, and strong with both legs. 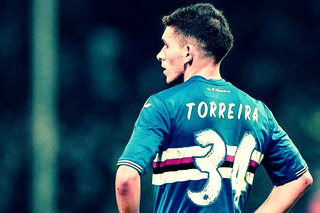 I love this player." Pep Guardiola: "Sane attacks and runs in behind like few players I have seen in my life. He is so good at attacking the space." Highlights (will be updated regularly). average player that hasn't impressed very much, had a couple of decent performances at best. Lennon level talent. He's my favorite City player. As mentioned in this thread, Along with bags of talent his head seems to be in the right place. Always a willing runner at both ends of the pitch. Sick player destined for GOATness. Raheem the Dream and In-Sane plus Patrick Roberts and Jadon Sancho for the next decade and the wings at the Etihad are going to be renamed the Killing Fields. @chemicalboy99 wrote: Sick player destined for GOATness. They're good when they have space and can use their pace rather than the brain. Patrick Roberts will be lucky if he's playing in the Championship. Sterling headed for that SWP/Lennon career trajectory. Sane is the only real legit talent here. Sterling has had a better career than either of those already tbh. All at a young age. Will be a decorated player by the time he's finished. Never forget that Ibe is better than Sterling. His and Sterling connection might be witnessing the next Robbery pairing here. Pep also needs to have a word with a few City players the amount of times I've seen Sane open and making a run and these guys either pass the ball back or to the side is painful to watch, you need the ball at his feet especially considering his confidence is through the roof atm. His potential is insane. I hope he turns into a striker as he gets older a la Henry. Bayern Munich chairman Karl-Heinz Rummenigge has revealed they opted against signing Leroy Sane as the club could not have guaranteed the Germany international regular first-team action. Sane was heavily linked with a move to the Allianz Arena, but eventually left Schalke for Manchester City instead as former Bayern boss Pep Guardiola lured him to the Premier League. "We cannot put a squad together by just stockpiling players, but have to take a good look at what we need every season," Rummenigge told Sport Bild. "Had we brought in Sane this summer, we would not have been able to guarantee him regular first-team action. "We already have Arjen Robben, Douglas Costa, Franck Ribery, Kingsley Coman, Thomas Muller and Robert Lewandowski. That is a great attack." Bayern were continuously rumored to be interested in Sané except for one problem. They wanted to wait until the summer of 2017 when his buyout clause of only €35 million would be in play. They didn’t want to get involved in a feckless spending battle. Schalke sporting director Christian Heidel confirmed as much in an interview with Süddeutsche Zeitung. Heidel states that Schalke were well aware that Sané planned to leave the club, so they decided to cash in on him while they had the chance. Bayern Munich have given Manchester City a free run at German wonderkid Leroy Sane after briefing that they have no interest in signing the Schalke starlet this summer. City are keen on signing the 20-year-old winger and have agreed terms over a four-year deal. However City are yet to meet Schalke's £42million price tag for the youngster, part of Jogi Low's Euro 2016 squad. Pep Guardiola has given the deal the thumbs up, after City monitored the youngster last season, believing Sane to be one of Europe's most-promising young talents. However Sane's father, Souleymane, claimed on Monday that both Bayern and Real Madrid were also keen on his son, telling Sky News in Germany that both "are also still in the mix." Yet after the claims of Sane's father, Bayern have briefed local media that they will not make any move for Sane in the current transfer window, having already made two major purchases in Hummels and Portuguese sensation Renatio Sanches. Bayern are believed to be keen on a deal next summer, when a clause in Sane's Schalke deal would allow him to join the Bavarians for £30million - at a time when both the club's veteran wingers, Robben and Franck Ribery, see their contracts at the Allianz Arena expire. Since 2017 Sane has started in 16 games scored 8 goals + 2 assists. ..but he looks decent so far. Future Goat, Needs to get better at beating his man 1v1 more. Doesn't do many take ons.